Democracy Indian Style explores the social and cultural factors underlying India's successful democracy by describing and analyzing the life of Subhas Chandra Bose and his impact on India before and after independence. As a nation India is very old. Its political culture has deep roots in India's pre-colonial history, but it is also a product of Western-style democracy, which has shaped and even created the nation. 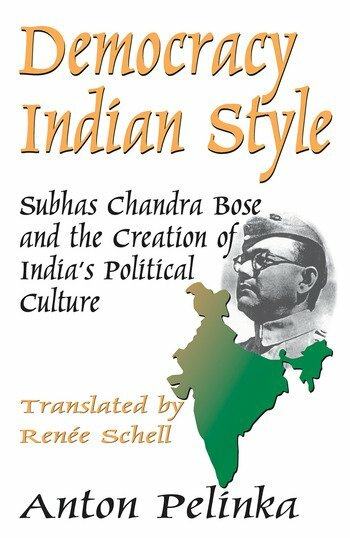 The analysis is balanced between chapters that explain Bose's life and career and those that describe the Indian political system. Anton Pelinka explains India's stable democracy as a mixture of British and American patterns—Westminster parliamentary rule plus federalism—and a specific set of power-sharing arrangements among religions, linguistic groups, and castes. Democracy Indian Style offers one answer to the enigma of how Indian democracy succeeds, by describing the working of India's constitution, the weaknesses of its party system, and the specifics of Indian elections. The focus on Bose provides a second explanation for India's political success. Democracy Indian Style is a timely exploration of the roots of Indian democracy, and will be of interest to political scientists, historians, and students of Indian politics. 8. No Parties—Or Too Many Parties? 10. India—One, Two, or Many Nations?